Wood veneer is a very thin sheet of real wood, similar to the individual layers in plywood. Typically on the order of 10 thousandths of an inch thick (.01" or about the thickness of the thin cardboard at the back of a notepad), it is available in pieces of up to 4'X8' sheets and can be purchased either with or without a paper backing or a "peel-and-stick" backing. As it is real wood, it is sandable and stainable or could even be painted, although that would rather ruin the purpose. Because of the thinness it can be bent into a fairly sharp curve; it is typically shipped rolled up in a box. 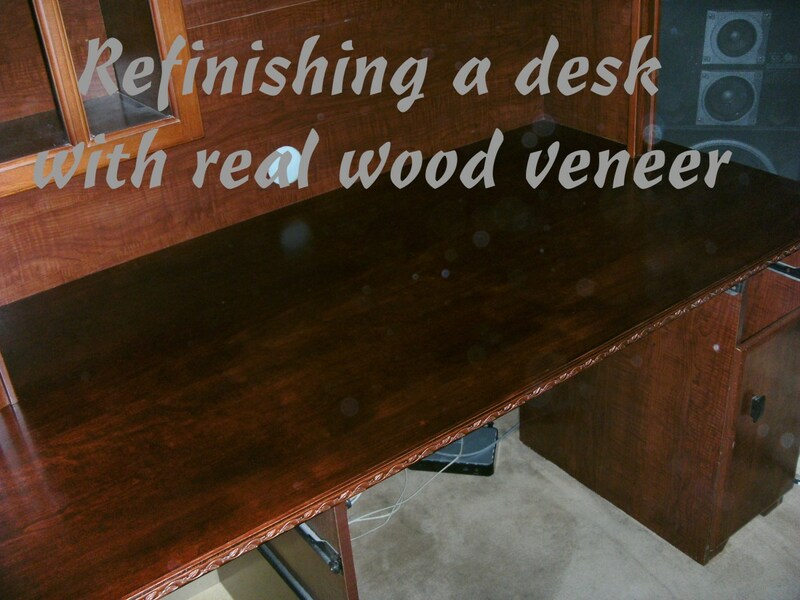 The desk refinishing project described in this article was the perfect use for wood veneer. 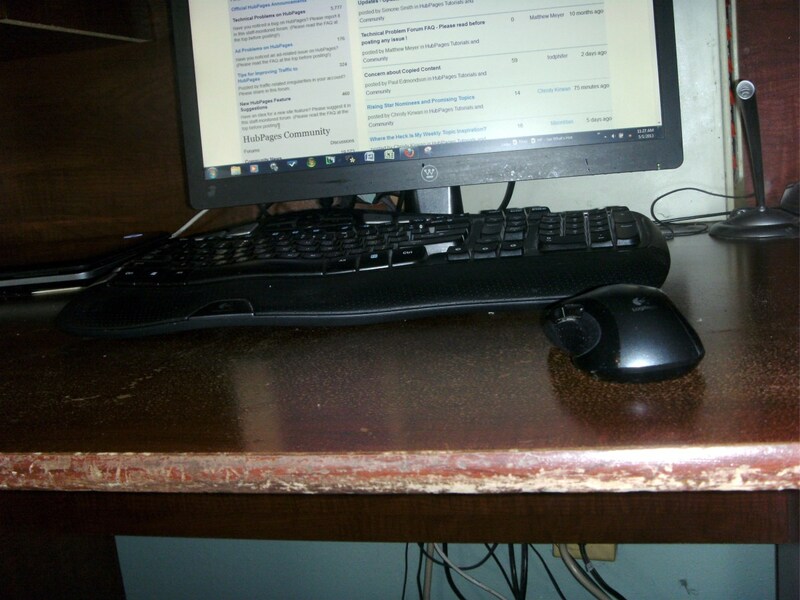 The desk was made of pressboard, and while the front was in good condition, the top of the desk was badly chewed up. Pressboard cannot be sanded of course, and needed to be covered with a new surface. 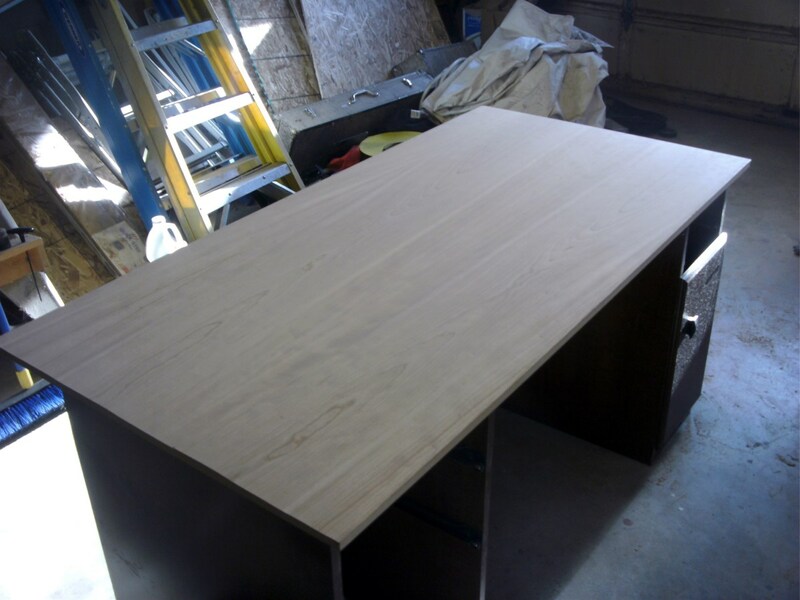 The computer desk to be refinished was constructed of pressboard and covered with a fake wood grain - one of the cheap furniture kits widely available. It was pretty, though, and fit my needs perfectly - far better to refinish it than to buy a new one both in terms of appearance and the cost necessary. All of the desk still had a good appearance except the top. That was gouged, the fake woodgrain was coming off all over it and it was almost too rough to write on. It was in desperate need of help. 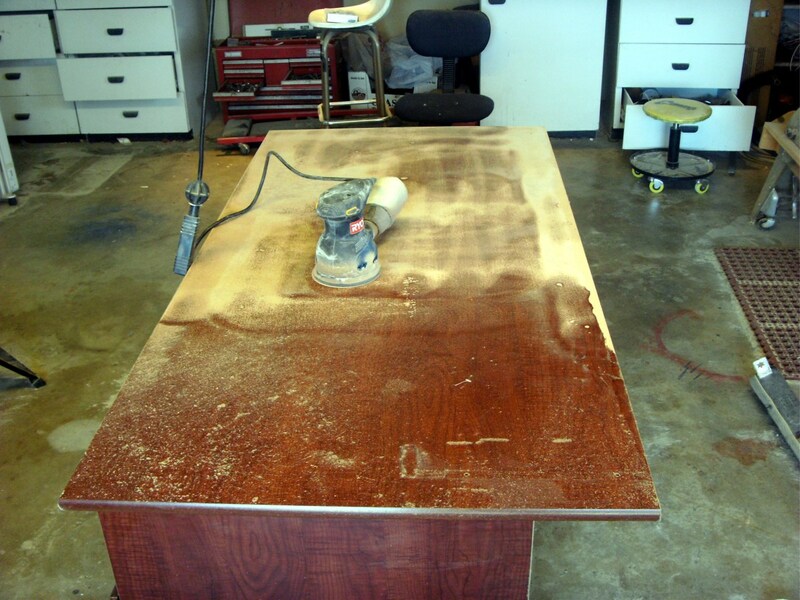 To start, the entire desktop was sanded smooth. Where it had been gouged the pressboard had been forced up and that needed sanded level, as did all of the smaller areas where the faux surface was coming off. Very small depressions were left alone, but anything of any size would have had to be filled. Veneer will cover small holes, but is quite limited in its ability to do so. In addition, the edges were rounded and the one in front had been badly damaged from years of being hit with a chair. Those rounded edges were all routed flat, making them smooth but also exposing the ugly pressboard. The saw guide shown in the picture was invaluable here as it produces an absolutely straight line for the router to follow. The edges, then, needed some extra work. The wood veneer to be applied to the top could have been cut and glued to the edges as well, but the choice was made to purchase a decorative edging and use that instead. It will be harder and will stand up to abuse better than the veneer will plus it is decorative and should add to the general appearance. Sanding was done with a random orbital sander and 150 grit sandpaper. 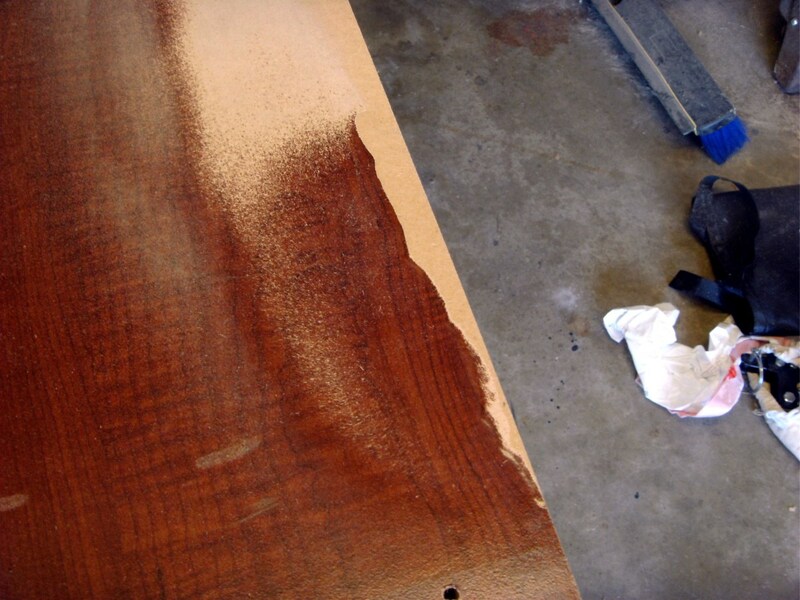 Finer grades of sandpaper were not necessary as the veneer was to be glued on and a slightly rough surface is actually preferable to being glass smooth. 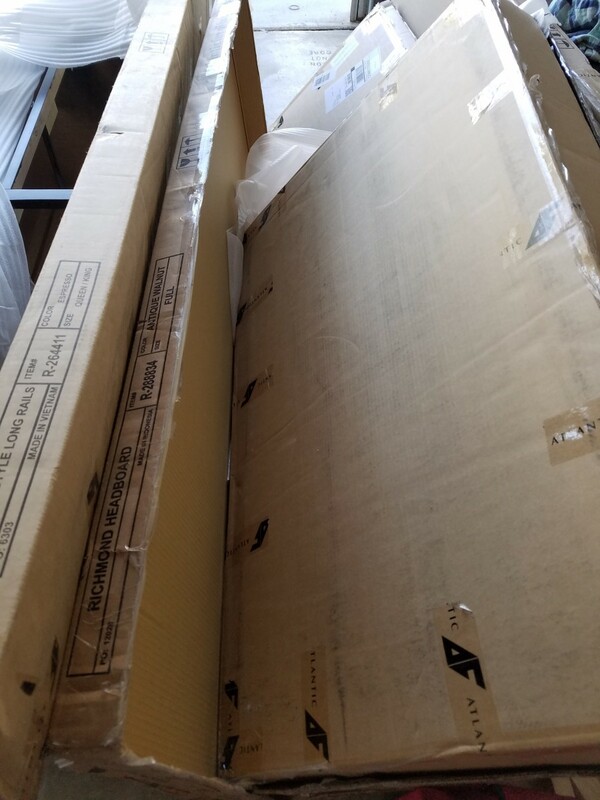 Real wood veneer is not readily available in most home improvement stores - the sheet used here was purchased from Amazon, where there are many different sizes and types of wood offered. A paper backed veneer was chosen as it is a little easier to handle and won't tear or rip as easily when working with it. While "peel and stick" veneer is available, it is probably better in most cases to use a contact cement instead as it will give a better bond that won't release over time. The cement, too, was purchased from Amazon, and I can recommend the Weldwood brand. 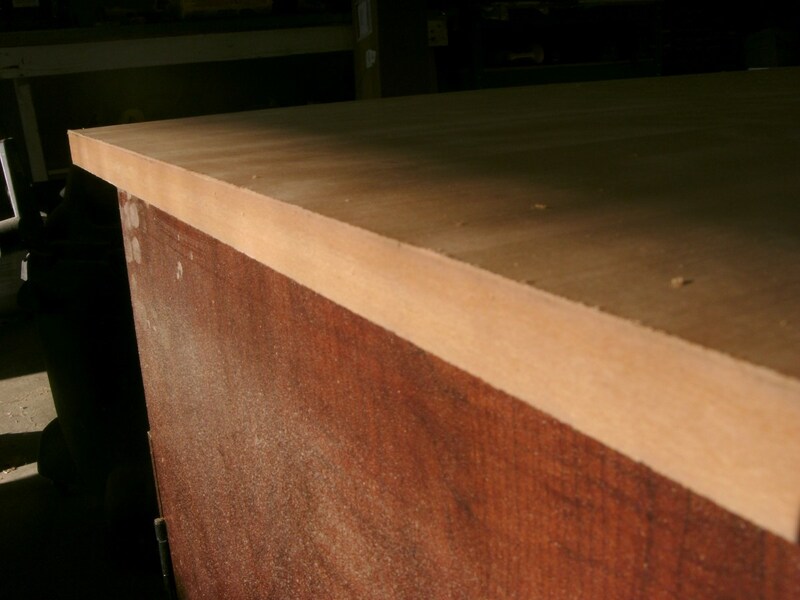 Care must be taken when handling veneer as it is fairly fragile and will tear easily. That doesn't mean that it can't be picked up, just take some care and make sure you don't crease it or rip it. 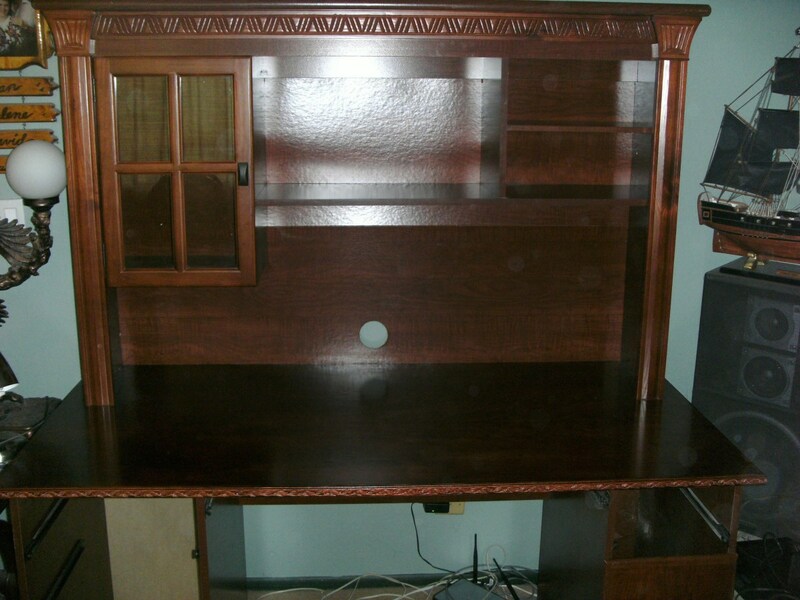 As there was no guarantee that the desktop was absolutely square the veneer was laid on the desk, rightside up, and extending past the desk about ¼" on one end and one side. Centered, this will give 1/8" overhang all the way around. Mark the bottom of the veneer on the two sides that are far too large but not the two sides just ¼" large, turn it over and using a razor knife and a straight edge cut it on the marks made. 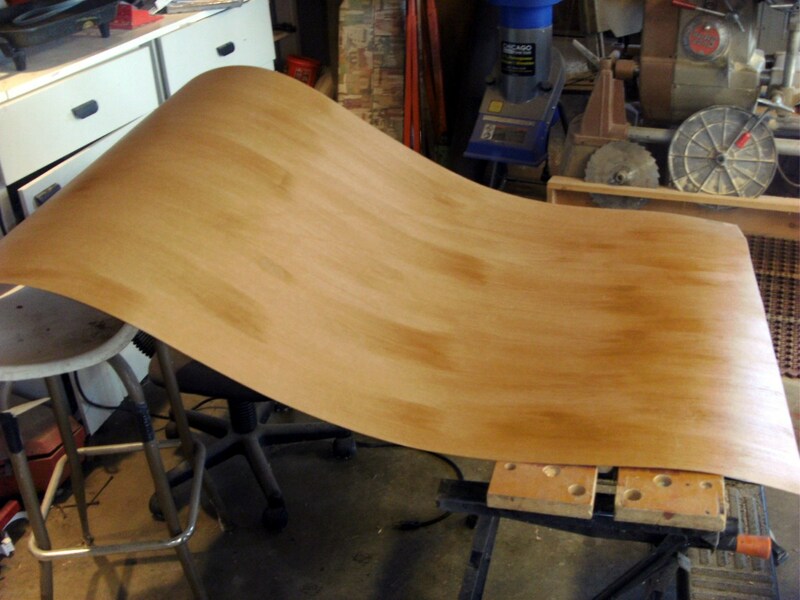 Paint the bottom side of the veneer and the desktop with contact cement with an old paintbrush or paint roller. It will require more than an extremely thin coat as the cement will sink into the wood surfaces to some degree, but don't make a very heavy coat, either. Let the contact cement sit until dry. 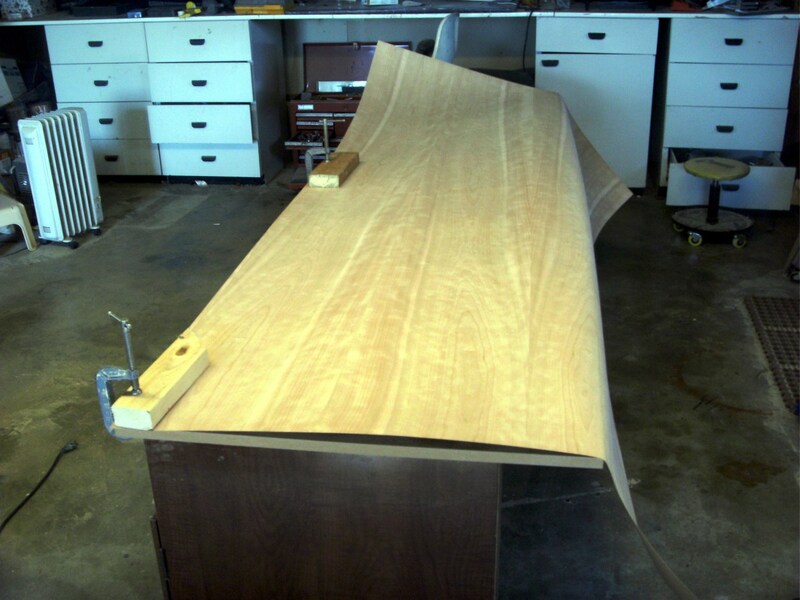 With a helper, set the veneer into place on the desktop. Make absolutely sure that it is centered, as once it touches it cannot be moved - with a good deal of luck you can remove it if only a very small area has touched, but you are just as likely to tear the veneer and ruin it. You have just one chance to get this right. 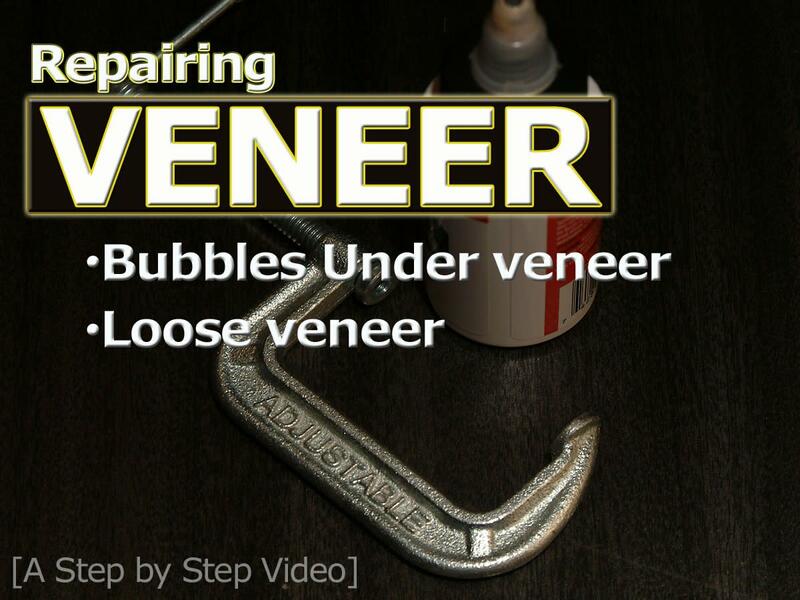 With the veneer in place, work any bubbles out by starting in the center, and working towards the edges, apply pressure. A rubber roller works very well here, but the heel of your hand will work, too. 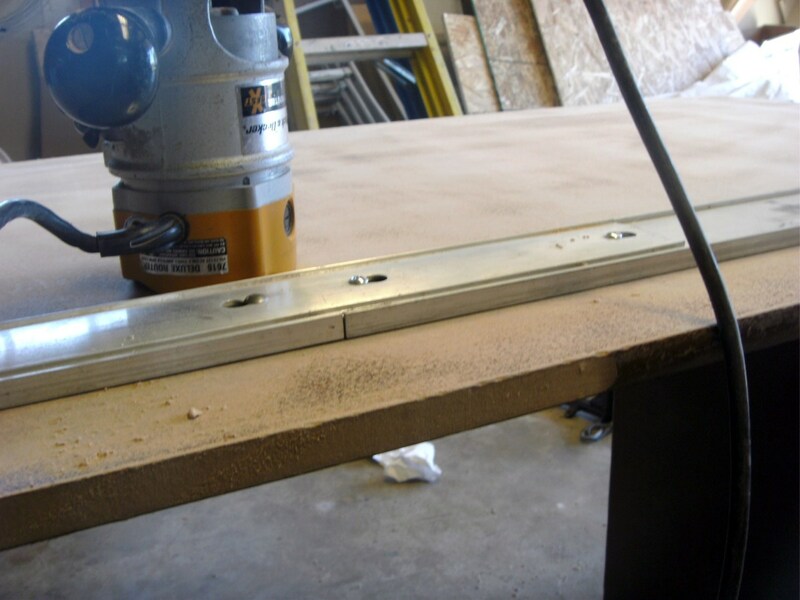 A router with a straight veneer bit was used to cut off the overhang. While it could be done with a razor knife, the router will produce a better edge. 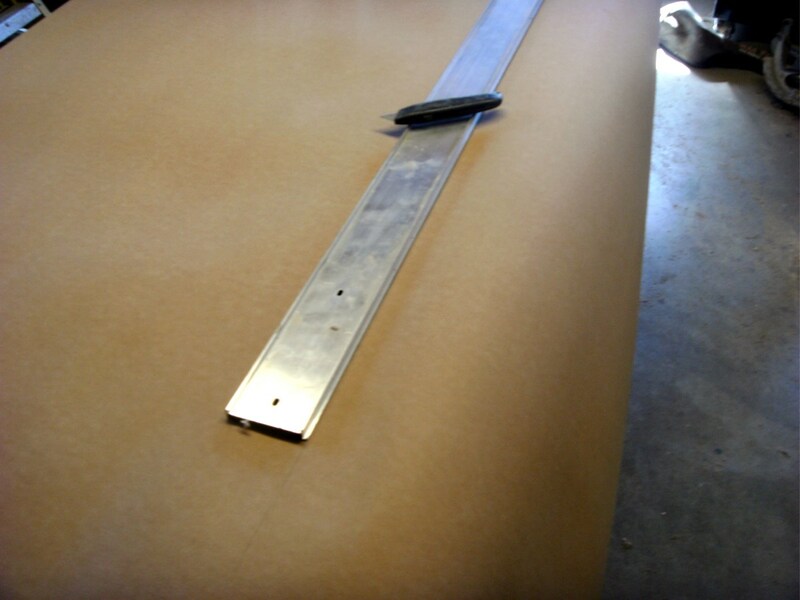 With the veneer glued on, the decorative edge molding was cut and applied with a brad nailer. 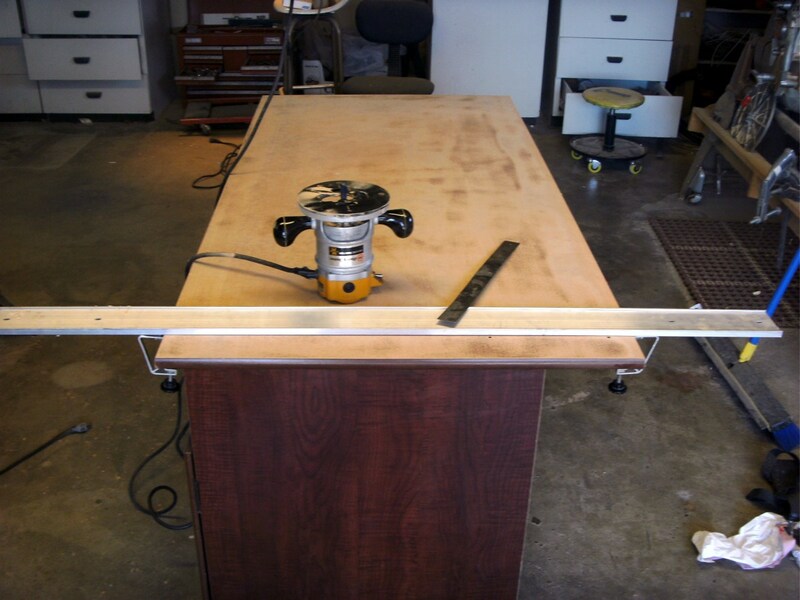 The edging was warped to some degree and required clamps as well as the brad nails as some of it had been sitting in a shed for over a year. Ordinary Elmers Wood Glue was used to supplement the brads. A very light sanding to level out minor imperfections of the edge molding and smooth any lifted wood grain in the veneer and the surface was ready for stain. With the new desktop in place, it's time to stain it. A drawer from the desk was taken to the local home improvement store and a stain that matched as closely as possible was chosen. 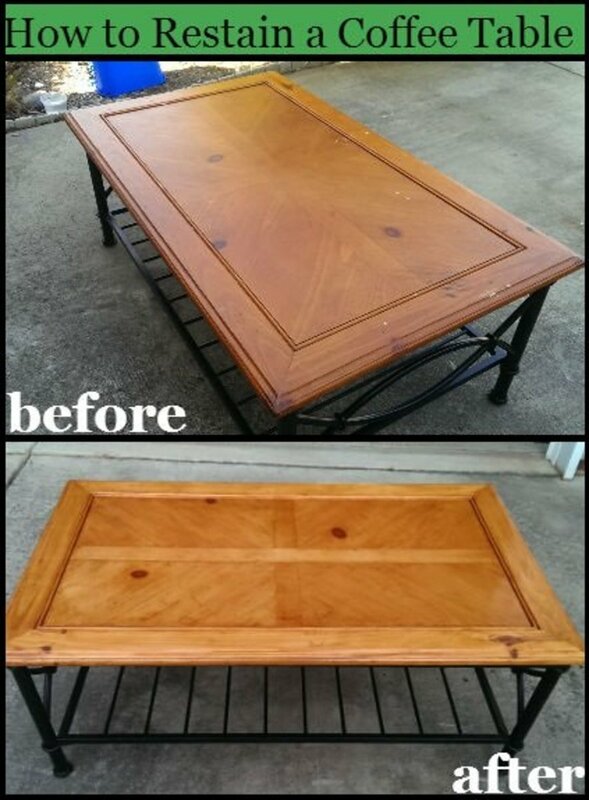 The original plan was to stain it and then apply several coats of shellac as a protective surface. Unfortunately the stain didn't match the existing color of the desk very well. You can never really know as the thickness of the stain coat will result in differing colors, as will the type of wood it is going on. 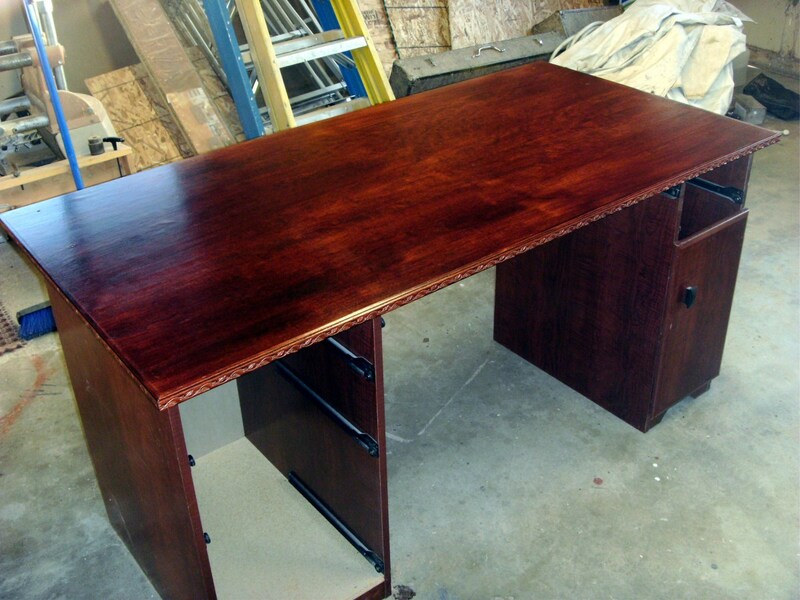 A second, polyurethane, stain that was on hand was used as a second and then third coat - the final color was very close to the original reddish brown of the desk. 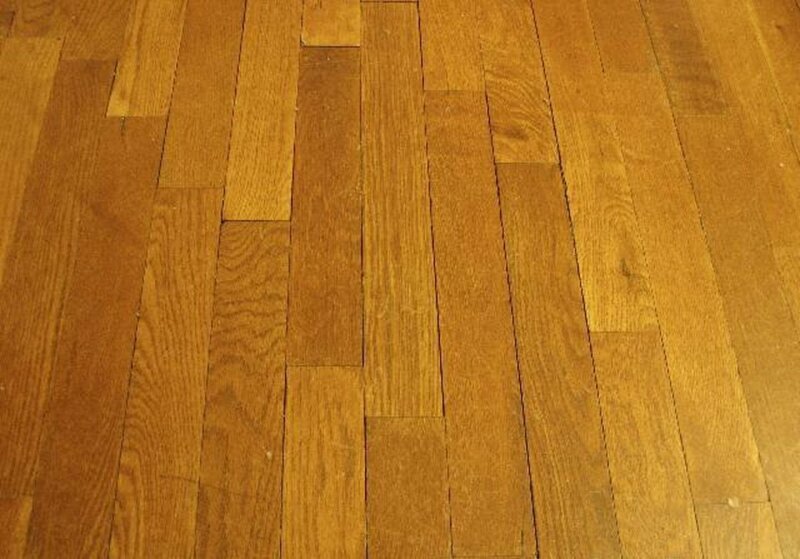 As long as the same type of stain is used, preferably from the same manufacturers, stain can also be mixed for custom colors prior to application and is another possible method of matching colors. 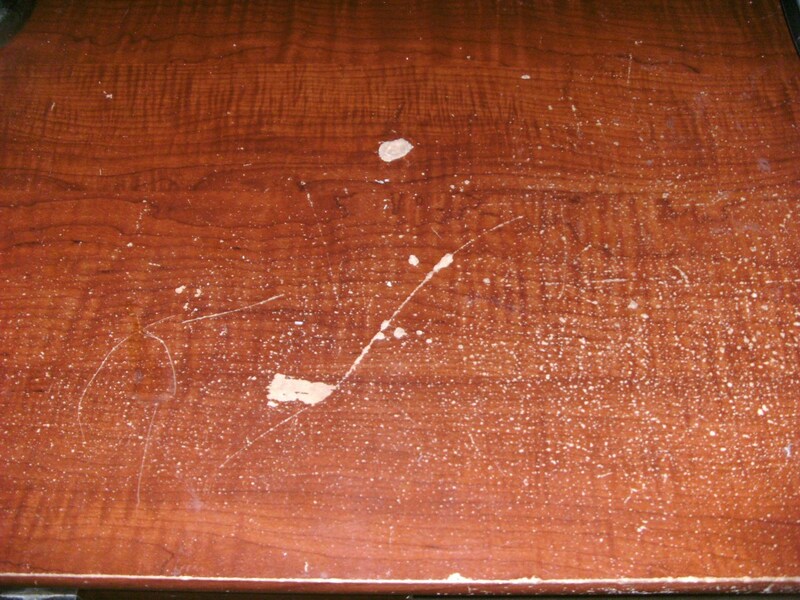 The few scratches and small imperfections on other areas of the desk received a light coat of the first stain; as they were all very small anyway they have virtually disappeared. 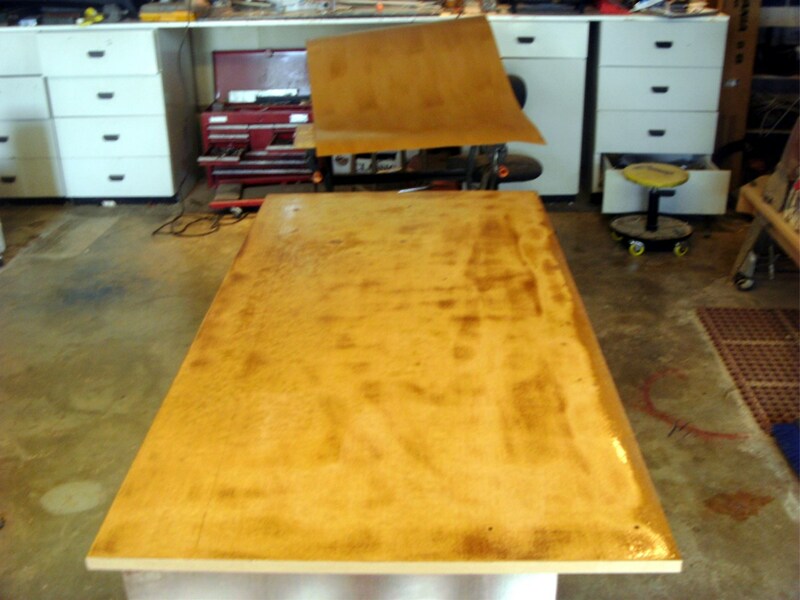 Two additional coats of a gloss polyurethane was then applied, sanding very lightly between coats with a 200 grit sandpaper, for additional protection. A keyboard, lamp and other items will tend to scratch the surface; 4 total coats of polyurethane will provide the protection needed to keep the new surface in good condition for years to come. In the end, it cost less than $100 for a new desktop. 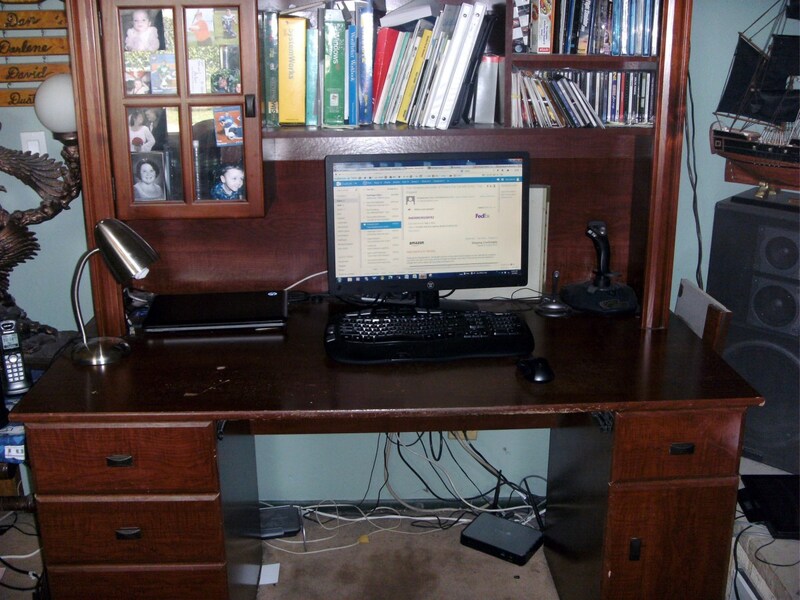 The assembled desk is back to at least the beauty it had when new and should remain that way for a long time. The wood veneer was just the trick for refinishing a large wood surface. Can you give me the approximate cost of a sheet of veneer? 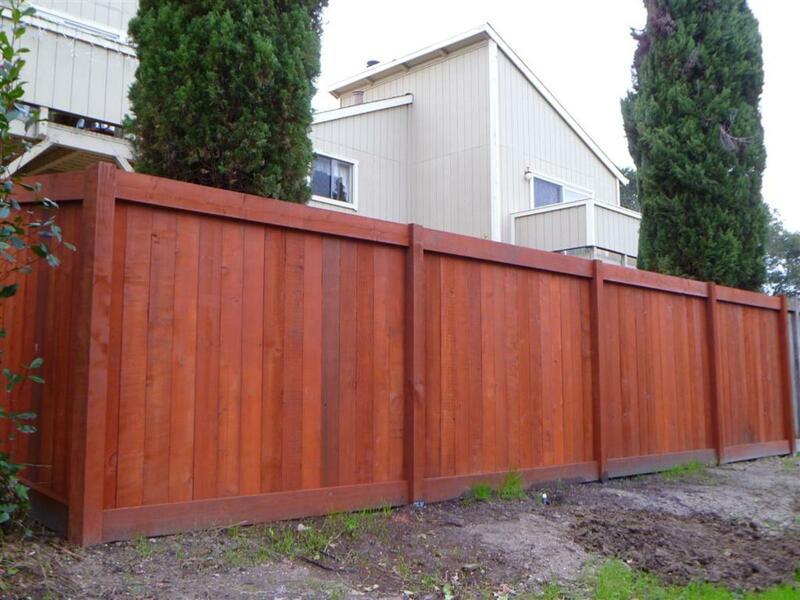 It will vary enormously according to the type of wood, manufacturer and size of sheet. The 4X8 sheet used in this project cost around $50. This was a great hub about how to refinish a desktop. 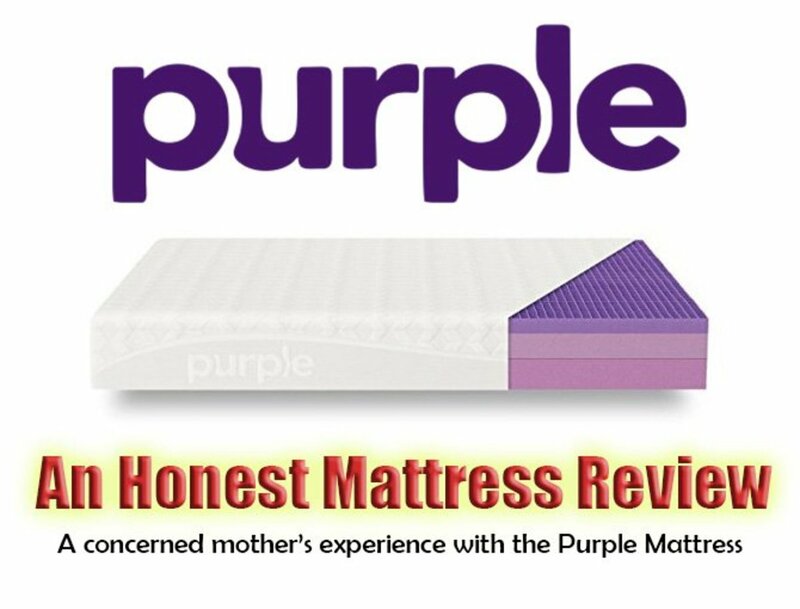 It's so handy and useful with some easy steps. Voted up! That desk looks pretty snazzy, very sharp, I like it! Awesome job! I could do this at home. Given the time, I would. Thanks for sharing about Veneer wood. I am planning a small cabinet for my DVD and stuff. 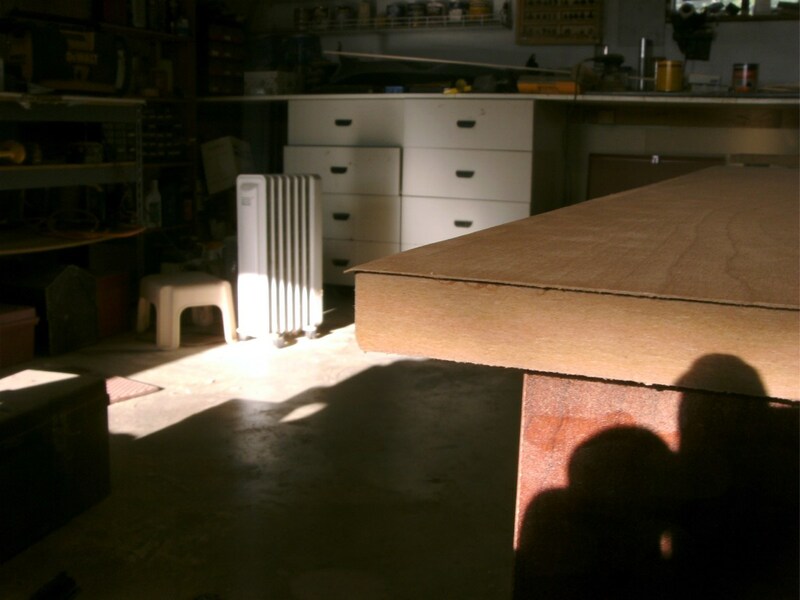 For years I have wondered how to work with veneer. This answered all my questions nicely. Thank you.